(Bloomberg) -- BNP Paribas SA, the biggest French bank, lost $80 million in derivative trades linked to the U.S. stock benchmark late last year as turmoil gripped global markets, according to people familiar with the matter. Lours was on vacation when the trade began losing large amounts of money as the S&P 500 tumbled, the people said. 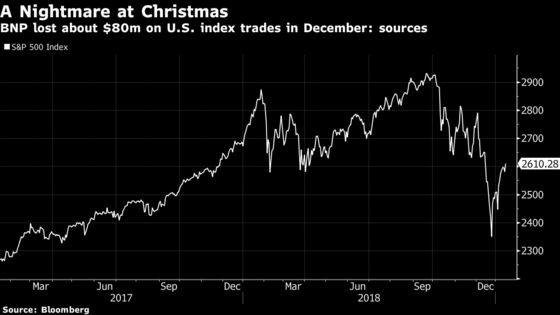 U.S. stocks posted several sharp drops in December due to fears over escalating trade tensions between the U.S. and China before quickly gaining again, whipsawing investors and traders. Lours didn’t respond to a request for comment made through his LinkedIn account, and a colleague at his desk in New York said the trader wasn’t in the office this week. Ilias Catsaros, a spokesman for BNP Paribas in New York, declined to comment. The losses add to problems at BNP Paribas’ trading unit, where Chief Executive Officer Jean-Laurent Bonnafe has been trying to bolster revenue and vault the overall investment-bank division into Europe’s top tier. Fourth-quarter trends aren’t encouraging either: Citigroup Inc. and JPMorgan Chase & Co. both posted plunging bond-trading revenue for the period this week while smaller French rival Natixis SA reported a hit of 260 million euros ($296 million) on Asian equity derivative trades in December. The Christmas trading debacle comes as the French bank winds down some of its other markets businesses. Last week, Bloomberg reported that BNP Paribas was in the process of closing its proprietary trading arm, Opera Trading Capital. This week, it emerged that the lender is winding down its U.S. commodities derivatives desk.